If you’re feeling a bit short of time this holiday week, perhaps Yog-Sothoth could help you out — or make it all so much worse. Yog-Sothoth is an Outer God of the Lovecraft mythos, and yet another of the oddling creatures in my Cthulhu Coloring Book. Yog-Sothoth was named The Lurker at the Threshold by Lovecraft, and is considered to be both at one with all of time and space, and outside of it. My interpretation of his form as “great globes of light” is a bit whimsical, so I decided to use actual watercolor to experiment with his coloring, and had fun working wet-in-wet to get some rather psychedelic effects. 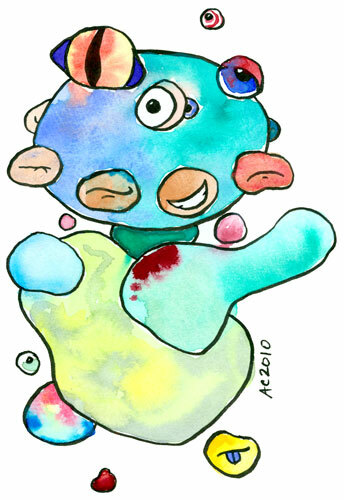 Yog-Sothoth, 5″x7″ pen and ink and watercolor on watercolor paper, $79 with free shipping.